Francis Younghusband, an interfaith pioneer who founded the World Congress of Faiths (WCF) in 1936, was born one hundred fifty years ago on May 31, 1863. His was a remarkable career. He was an explorer; he served in the army; was one of the first Europeans to cross the Gobi desert; explored dangerous mountain passes in the Himalayas; led a controversial military mission to Tibet; advocated self-government for India; and was a journalist and author. One reviewer said of his books: “Younghusband has written many books, each one worse than the one before” – which I take as a warning. Younghusband was deeply influenced by the teachings of Tolstoy, Baha’ullah, and Sri Ramakrishna – indeed Christian leaders in Britain for some time criticised WCF as being a front for neo-Hinduism! Younghusband himself regularly attended church services, but he saw Jesus as a heroic example of love and self-sacrifice to be emulated – even surpassed – by others. His talk of “a Christ that is to be,” a “God-Child” or a “World Leader” from another planet was not welcomed by church leaders. 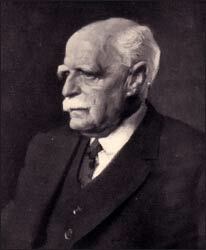 Sir Francis Younghusband died just over seventy years ago and was buried at Lytchett Minister. His ornate grave is in urgent need of restoration. An appeal to raise funds for a restoration is being planned. If you would like to help, please contact Tony Reese, WCF, 125 Salusbury Rd, London NW6 6RG. Younghusband’s hope was that WCF would inspire a spiritual fellowship awakening in people of all traditions to this universal experience of cosmic joy. Younghusband envisaged the World Congress of Faiths as a worldwide movement, rather than as an organization. Indeed the ‘interfaith movement’ is far larger than any organization. Younghusband would certainly have welcomed its growth. 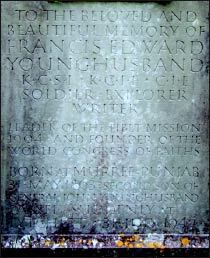 There are two biographies of Francis Youndhusband: one by George Seaver (John Murray, 1952) and the other by Patrick French (HarperCollins, 1994). I give a summary of his life and thought in my new book Widening Vision: The World Congress of Faiths and the Growing Interfaith Movement (available from www.lulu.com). Newer PostFaith-based Environmental Work Makes Inroads at the U.N.